Boxcutters, Jigger, Muddler, Shaker Classic/Boston, Strainer, Martini Glass. In a cocktail shaker, add 2 orange wedges and crush with a muddler. Add the remaining ingredients except champagne. Fill with ice. Shake vigorously for 5 seconds. 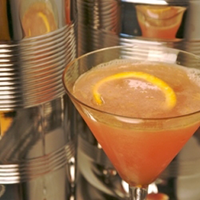 Strain into a Martini Glass and top with champagne. Garnish with a twist of orange peel and a raspberry.